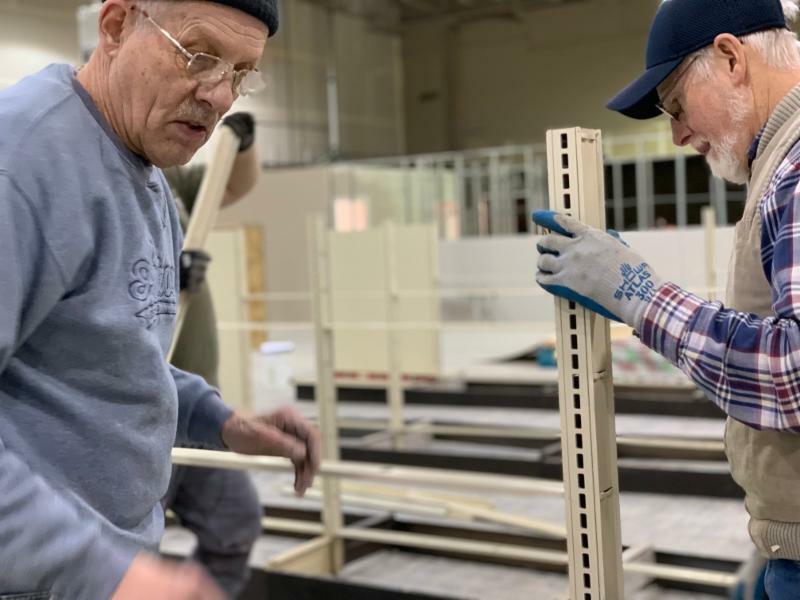 Jim Andringa (left) and Ken Wild (right) help with assembling shelving at the Smokey Point Habitat Store February 23rd. 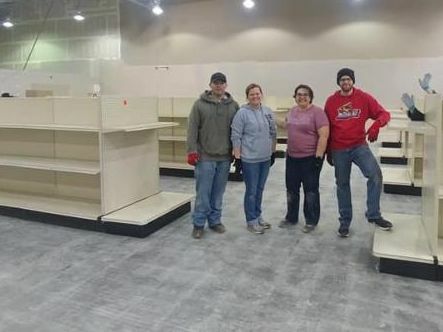 Thanks to many volunteers, the Smokey Point Habitat Store construction and set-up is well underway! Over the last few weeks, we sent out emails requesting help at the store and we received an extraordinary response. Our generous volunteers assisted with drywall installation, shelving set-up, door frames and fixtures. Interested in helping? Please sign up to help with store set-up here . If you have not yet attended an orientation, you will be prompted to do so. Volunteers will also be needed to assist customers and to prepare merchandise for sale once the Smokey Point Habitat Store opens this spring. Pictured right: volunteers help March 1st & 2nd with drywall installation & shelving. Additionally, we want to thank ALL volunteers who showed up to help while the snow was on the ground. Earl Shafer volunteers primarily in our Lynnwood Habitat Store accepting and pricing donations. 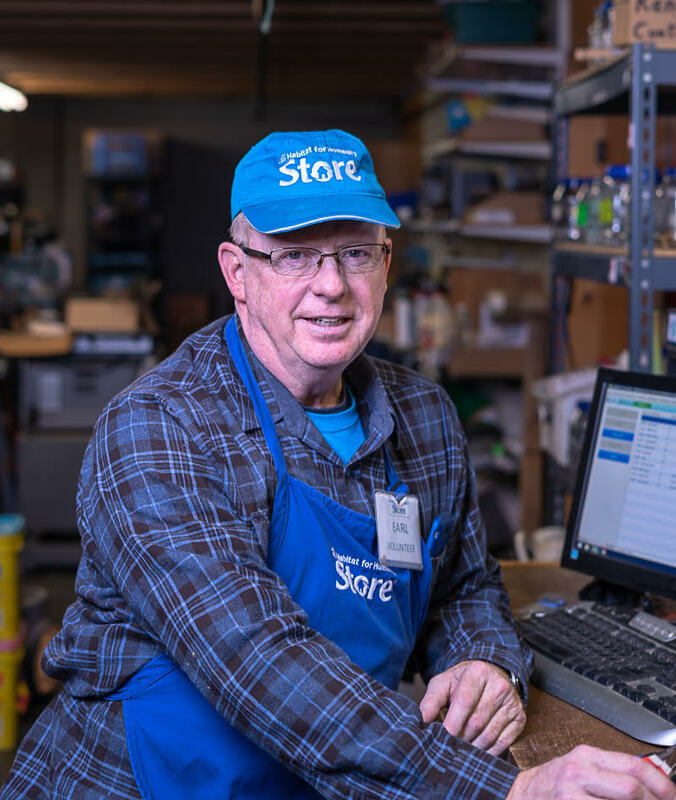 Earl has also volunteered in variety of other ways, such as installing new lights into our Lynnwood Store, on the Twin Creeks Village build site and more. He is also organizing a group build day at the Gold Bar Veterans Build for the organizations where he is a member; Mill Creek AMVets and Snohomish County Hero’s Café group. Before serving our community as a Habitat volunteer, Earl served our country as a U.S. Air Force Lieutenant Colonel. He worked in aircraft maintenance and logistics and served in Vietnam and Saudi Arabia. After his 31 years of service, Earl worked as a civilian on base in Ohio and then retired. Though Earl has retired from serving our country, he hasn’t retired from serving his community. Earl began volunteering with Habitat in Dayton, Ohio on home build sites. He volunteered there for about seven years and moved with his wife back to Washington to be close to family. 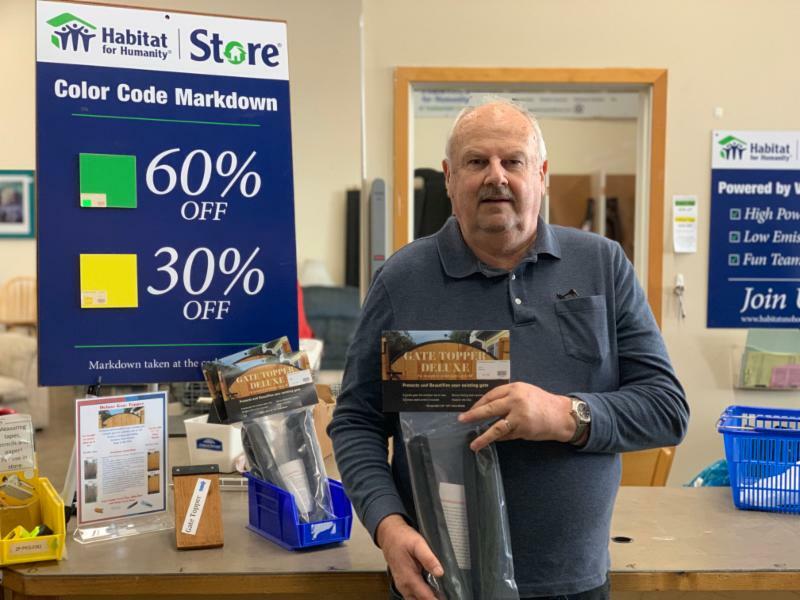 Now he’s given more than 1,000 hours of volunteer time to Habitat Snohomish since 2016, spending about one day per week at our stores and occasionally in other areas of the organization. Earl contributes to the Veterans Build Committee and participates on the build site. He also volunteers at Interfaith Family Shelter in Everett. 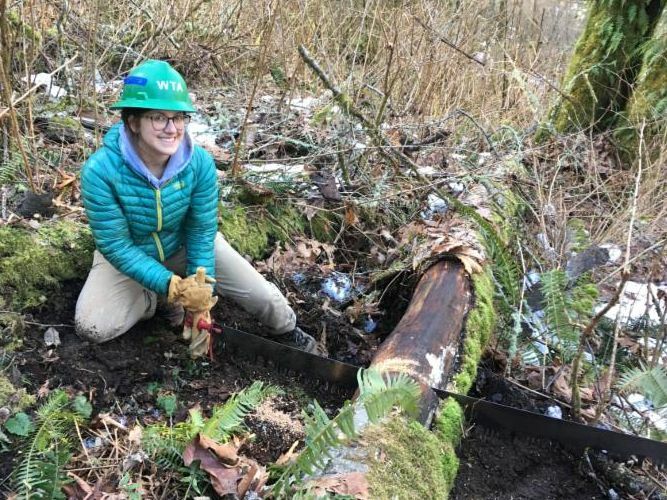 Our Resource Development AmeriCorps VISTA Shelby Brewster, completed her MLK Day of Service with Washington Trails Association. Delayed due to snow – her service day had to be rescheduled. Shelby spent the day maintaining the trails at Lord Hill Regional Park. 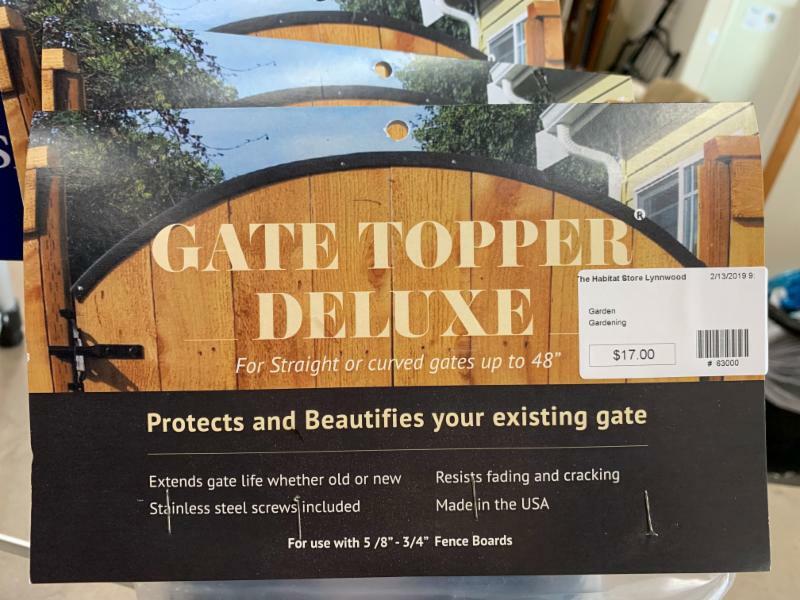 Our Lynnwood Habitat Store volunteer, Dave Carson, creates gate toppers and donates them to our stores to sell! Dave first recognized this need at his own home about a year ago. He then realized they’d make a great product for our store! Thank you for sharing your creativity with us, Dave! Do you create something unique that could be sold in our home improvement stores? Learn more about store donations here or call our material donations manager at 425-405-7770. Lynnwood Habitat Office: March 12th & 27th at 4 p.m.
Everett Habitat Store: March 19th at 4 p.m.